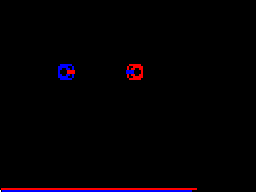 Color Robot Battle is one of the earliest commercial programming games, published 30 years ago for the TRS-80 Color Computer by The Image Producers. The game is played by writing programs to control a robot's movement, sensors and weapons. Programs are written in a hybrid of the BASIC / Logo programming languages. Two robots enter an arena with the survivor being declared the winner. Color Robot Battle is a fantastic example of compact code. 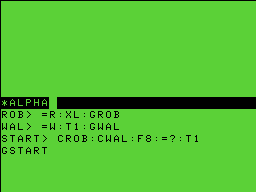 The game, compiler and full screen editor are all written in 6809 assembly language and somehow manage to fit on a 4K ROM. movement: followed by a number. Movement commands are F(orwards), B(ackwards), L(eft), R(ight), H(alt), T(urn), D(irection). conditional: detect what the robot is facing. =(true) or #(false) followed by R(obot), W(all), M(issile), L(aser), S(omething - any direction), ?(random). flow control: C(all) or G(oto) a label. Labels are defined at the beginning of a line and terminated by a >. attack: XL to fire the laser or XM to fire a missile. The program starts at the label START>. Multiple commands on one line are separated by a colon :. If a condition fails the rest of the line is skipped. This is similar to Robocode. I don't understand 2 rules. 1. What's the difference between a laser and a missile? 2.How exactly is random defined? anonymous: a missile take more energy to fire than a laser and also does more damage. In the screenshot the missile is white, the laser is red. Random is either =? or #? and has a 50/50 chance of skipping the rest of the line. Just found your blog and I like it. This takes me back to the 80's. It's like a museum. Thanks for posting all this and I'll be back. Probably uncouth to ask this, but does anyone know of a .ROM image for Robot Battle online? My Coco is long gone and this game brings back fond memories of my first programming experiences. Would be neat to try again.